A project commissioned by one of our clients to emphasise the technical aspects of their products. 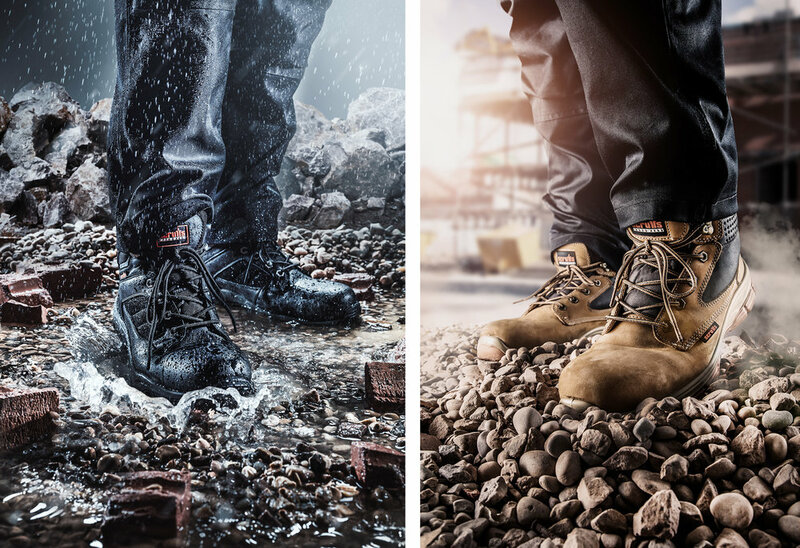 Two boots, designed to be tough and breathable in hot weather and durable and water proof in wet conditions. For both images we constructed the rugged sets in the studio for photography to allow maximum control on conditions and lighting giving the final pictures impact and atmosphere. 2018 I 2019 Power and Lighting Solutions Catalogue Complete. Here’s a small section of images we covered, from standard products shots to meticulous ‘Inside Insight’ creative shots, to creating believable environmental sets… all photographed and created in-house at the Liquid Image studios. To help promote your product to the highest level, why not consider using Liquid Image; we specialise in imagery for advertising photography that sells products and brands. We recently welcomed the team from Esper Design into the studios; creators of light stage and multi-camera power and control technology for the VFX, gaming and photography industries. We were commissioned for new imagery for showcasing there new website and extensive collection of products. Our team is happy to work from an existing idea or develop a new one that meets your commercial objectives. A company's brand identity is how that business wants to be perceived by consumers. The components of the brand (name, logo, tone, tagline, typeface, photography) are created by the business to reflect the value the company is trying to bring to the market and to appeal to its customers. These instalments are part of the new initiative. We've been busy set building and photographing a new range of bedroom furniture in the studio. Working closely with the client to establish the colour theme and set design we produced the image below. Careful planning helps bring together all the elements to create an eye catching final picture.